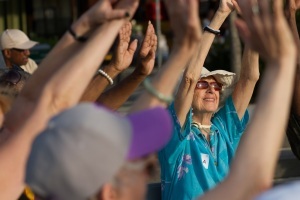 •Free, community-based dance programs – Movement Speaks® and Dances for Seniors – for low-income, minority and culturally underserved older adults. We have offered programs at over 35 senior centers serving thousands of seniors. •Low-cost dance classes for adults of all ages, held at the University Settlement, Rod Rodgers Dance Studio, the 92nd Street Y, and other NYC locations. •Free site-related professional dance performances staged in many of New York City’s most iconic public spaces, including Times Square, the High Line, Washington Square Park, Riverside Park, and the Whitehall Ferry Terminal.